Now my next phone is gonna be from Intel with Meego,Intel has just backed Meego with many other big players like BMW. Nokia shareholders should vote Mr Elop out,yeah it's knives out for Elop. its DEAD!! 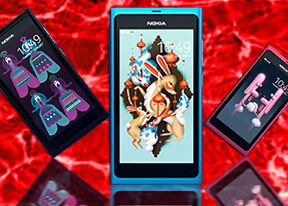 NOKIA N9 rest in peace!! your memory will always be just nothing but a rumored and a fairy tale!! IMAGINE a phone with INTEL INSIDE...it would be beast!!! that's what nokia's biggest fault ever for choosing microsoft! First Timer, 11 Feb 2011If the N9 meego OS is scrapped but not the hardware and nokia decides to go with wp7, does the... moreNo, nokia didn't scrapped the meego Os. But i don't know about n9 be announcing though. I hope they choose meego as their primary Os. First Timer, 11 Feb 2011If the N9 meego OS is scrapped but not the hardware and nokia decides to go with wp7, does the... moreNokia n9 launch in mwc 2011. Go to google search (nokia n9). If the N9 meego OS is scrapped but not the hardware and nokia decides to go with wp7, does their lifetime free ovi map still stand? Very bad news Nokia fans!!! Anonymous, 07 Feb 20115 mp?? why is the camera were just 5mp? ?It says 5mp, but we are almost positive it will get the n7's 12mp which was pretty much proven to take the best pics any phone took. Atleast as far as 12mp goes. It even took better pics then the sony camera(CAMERA NOT PHONE) they used in the review. Combine that with it's much better hardware and it would be the best camera phone out. It needs something so the Samsung Galaxy S2 doesn't kill it in every aspect at least. Nokia n symbian r made for each other. Nokia should not leave symbian os. In fact nokia should focus on its Ram & Rom. D hidden power which nokia has is Linux.. I dnt know why r they isnt using their linux os.. Anonymous, 07 Feb 20115 mp?? why is the camera were just 5mp? ?Because these people have no idea what they're talking about as usual. Just posting a load of nonsense as if it is truth. The processor doesn't sound right either, but we'll see in a few days at MWC. They should also make the screen cover as much of the face as possible while still focusing on making the handset as energy efficient as possible. therefore making sure the battery effectively lasts at least two days of average use before needing to be recharged. this Handset running on the android OS would be the ultimate Handset for not just Teenaged Girls but also Business people. why is the camera were just 5mp?? DGui, 03 Feb 2011Might be too big for a phone but that's what they said about the whole GPU thing as well, but ... moreI think that the S series are the Tablets.